Firm Leadership Is NOT For Wimps! Are You Getting The Minutes From Your Practice Group Meetings? Are You Developing A Star Culture? Do You Know What It Takes To Be A Firm Leader? Are You Being Afflicted With Strategy Viruses? This text provides prescriptive counsel to new firm leaders on what actions they might consider as they begin undertaking their initial responsibilities. Included is the experienced wisdom and real-world commentary of some twenty law firm leaders. 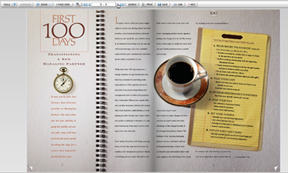 Patrick McKenna has written a fabulous new 23-page-book called FIRST 100 DAYS: Transitioning A New Managing Partner. I showed Patricks monograph to some clients of mine outside the legal profession, and they agreed that it is incredibly useful and well-written. The book is both short, and terrific, an easy on line read in one sitting. The entire monograph consists of about a dozen pages of Patrick's distilled wisdom on "The First 100 Days," followed by another dozen pages of invaluable observations from Managing Partner's themselves, all in response to Patrick's asking them where he'd run off the rails in his advice. (The answer: Nowhere that you'd notice.) . . . So, if a tour of duty as a Managing Partner is on your horizon, either distant, indistinct, and as vaporous as a dream, or if it's beckoning as clearly as F. Scott Fitzgerald's green light at the end of the dock in The Great Gatsby, you need to read this. And if you don't know Patrick, you should. Recognizing that the new managing partner of any firm is about to have his or her life change, and that the new task is often addressed with anxiety and confusion, McKenna has assembled extraordinarily sound advice to guide the way to establishing domain and leadership in the first hundred days in office. This simple manual is real and practical. It is a strong, clear, and knowing voice that rises above the usual leadership claptrap that abounds today. First 100 Days is a quick read, but even experienced managing partners will learn a lot. Patrick's writings, which include First Among Equals (co-authored with David Maister) and Herding Cats (co-authored with Gerry Riskin), are among the leading works in the field. Talk about a favor! Patrick McKenna of Edge International has delivered a good size one for any managing partner taking up the mantle of leadership. McKenna has published a free online book titled First 100 Days: Transitioning A New Managing Partner. Patrick McKenna has written a clever and insightful 'e-book' on what managing partners should consider during their first 100 days in office . . . Read: First 100 Days by Patrick McKenna - it is short and full of wisdom for any leader. Leading large organizations is hard. Being a new leader in a partnership is especially hard. Law firm strategist and management consultant Patrick McKenna offers an excellent short guide for new managing partners at law firms. First 100 Days is a step-by-step guide for new managing partners. This is a good read for BigLaw CIOs and technology managers who want to understand more about how law firms operate, especially when leadership changes. Congratulations! Your firm has voted you managing partner. As the initial elation dies down, you face the inevitable question: Now what do I do? You turn, of course, to the instruction book "First 100 Days: Transitioning a New Managing Partner." The book offers a useful checklist for new managers as they plan their initial and longer-term actions. McKenna offers useful observations about law firm management. Patrick McKenna is a true expert in the law firm management field, having co-authored several books in the field, including First Among Equals. You would have to pay quite handsomely if you retained this gentleman for advice, so take advantage of the fact that he is willing to give it away. The truth is, all the marketing-savvy in the world won't help us in guiding our firms to embrace and pursue significant marketplace directions unless we understand and employ effective leadership techniques. What's more, leadership in a professional services environment presents unique challenges -- dealing with difficult-to-herd-experts. The result is often an agreement that is based on lowest common denominators rather than the pursuit of truly competitive strategies. That is why I heartily recommend Patrick McKenna's new, brief and complimentary e-book, First 100 Days: Transitioning a New Managing Partner. The book uses a number of law firm examples, but the principles are very applicable to other professional service sectors. Also, don't let the book's title hide its important nuggets: even long-tenured professional services firm leaders can benefit from McKenna's insights about starting a new leadership role on the right foot. In a new book, Patrick McKenna, one of the leading consultants to professional service firms worldwide, addresses the critical first 100 days in the transition of a new MP. It is direct, tightly focused and brief -- yet loaded with practical wisdom. Recognizing that the first 100 days for a new MP often begin anxiety and confusion, McKenna offers sound advice that will help establish leadership credentials. You will enjoy Patrick's solid content based on his extensive research and terrific insights. Patrick's latest offering makes an important addition to the toolkit available to professional service firm strategists and I strongly recommend it to anybody taking up a leadership role in such a firm.